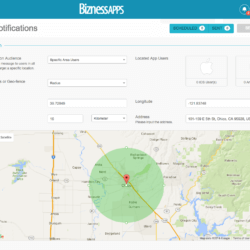 With over 500,000 apps under their belt, San Diego-based Bizness Apps must be doing something right. They are one of the fastest growing private businesses in America and focus on quality and ease, offering, like others in this industry, code-free app building for those who ‘struggle to turn on a computer’. They offer niche features for app makers not often seen in other builders. For example, if you need an app for your golf course, you can easily build this detailing each hole’s distances, par info and more. You can even include a built-in scoring system for players, perhaps giving the caddy a little less work! 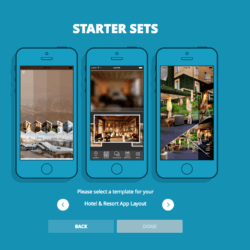 Apart from the above, Bizness Apps offer styles and features covering the gamut of app categories: from restaurants, to fitness and even real estate, you’ll find most of the essential features you need on their platform. But is this enough to raise them to the top tiers of app builders? Let’s find out. Your native Android and iOS app, as well as iPad support. Unlimited PWA or Android + marketing tools for your business. Need to pay a hefty sum for each iOS submission. 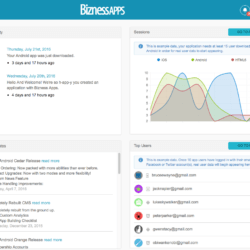 Apart from fast and friendly email and chat support, Bizness Apps have you covered in all other areas of app building knowledge. 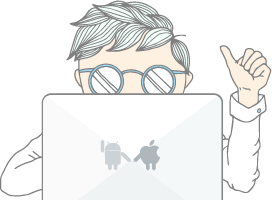 With a great selection of illustrated step-by-step guides, and a video channel, these are just some of the features they provide to help you become an app-maker pro. They include a few features not seen before in other app makers we’ve tested, such as: tutorials for first-time users of your app; a car finder that allows you to leave a pin on your map, as well as notes and reminder for parking meters; customised food ordering/delivery and animated home screen sliders. Apart from integration with Shopify and Magento, you can create a menu with prices, or a catalogue of your products as well as an in-app checkout. The cherry on top is that the payment system they use, Braintree, allows fee-free transactions until you reach $50,000 in sales. Although the main mobile app tier includes a lot, such as iPad compatibility, it’s still above the highest tiers of our top rated apps. Also, mobile website plans are often much cheaper than that offered by Bizness Apps. Whilst they have quite a few templates to choose from, it can be taxing trying to remove demo data at times, and the fact that you can’t change your template without starting from scratch could be painful for some. The sign up is easy, but does require a phone number. 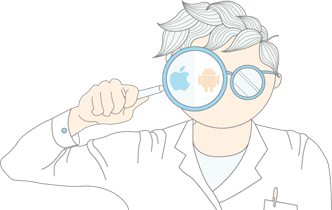 The editor itself is logical in its design, but not as user-friendly as other app makers. Their pop-out preview felt a little slow compared to always-on previewers. You also have to manually save every time you make a change, which can be a little grating. Fortunately the system reminds you every time before you leave a page. Their templates are generally good, with modern themes and three separate designs for each category. They also have a unique customisable animated slider feature. These are good for product previews and can be linked to other sections. Unfortunately there’s no easy way to switch templates once you’ve begun building, without starting from scratch. Also it can sometimes be a little confusing figuring out how to remove the demo data. The website is only available in English, while the app content supports most languages. 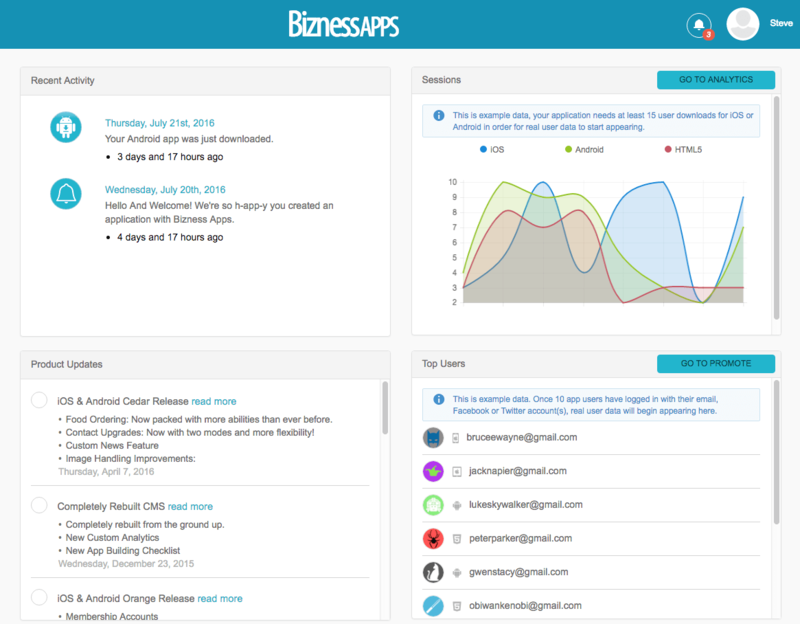 Like many other app makers, BiznessApps is now focusing on Progressive Web Apps following Apple’s new guidelines. You will need to pay an extra fee of $199 for manual review before you can submit your app to iOS. iAds, AdMob, Double Click and your own. Available on the Mobile App plan, and offers particularly easy to use geolocated, scheduled and segmented notification options. They have both a ‘directions’ and an ‘around us’ feature, which are basically different takes on a point of interest map. You’ll need to input the information for users. They can then use Google or Apple Maps to see where the points are and get directions. Ecommerce options for Bizness Apps are quite good as they have integration for Magento or Shopify stores. Also there’s a customisable catalogue if you want to make a store from scratch. The checkout is connected to Braintree, allowing payments via credit card, Paypal and others. A benefit of Braintree is that they don’t charge any fees for the first $50,000 in sales. An RSS feed is available as a standalone feature. This is available via the ‘info tier’ modules. They don’t have specific social media integration for Facebook or Twitter, you have to add each via the ‘webpage’ feature. There is an integration for Instagram, in that you add your own feed, although you can’t alter the appearance of the gallery at all. They offer both a mobile ‘stamp’ feature, in which the business owner personally verifies the stamp, and a GPS coupon which can be activated via check-in when within a defined zone. There are 6 mail integration options to allow users to sign up to your newsletter: MailChimp, Campaign Monitor, GetResponse and more. You can compare them here. You can test it with the native app, and it mostly works well. Annoyingly it doesn’t retain your login information, so you have to log in each time you reopen it. Also, it’s constantly using your phone’s location (even when not open), which can drain your battery. Not the greatest app for an app maker. They have all the basics such as device usage, features visited, countries of users. There is no Google Analytics integration as they have updated their CMS to give more accurate data than what Google is able to do. Their reseller program is $250 p/m, which gives you unlimited Android apps and PWAs. They have tons of marketing material and tools. Read more about their reseller program here. 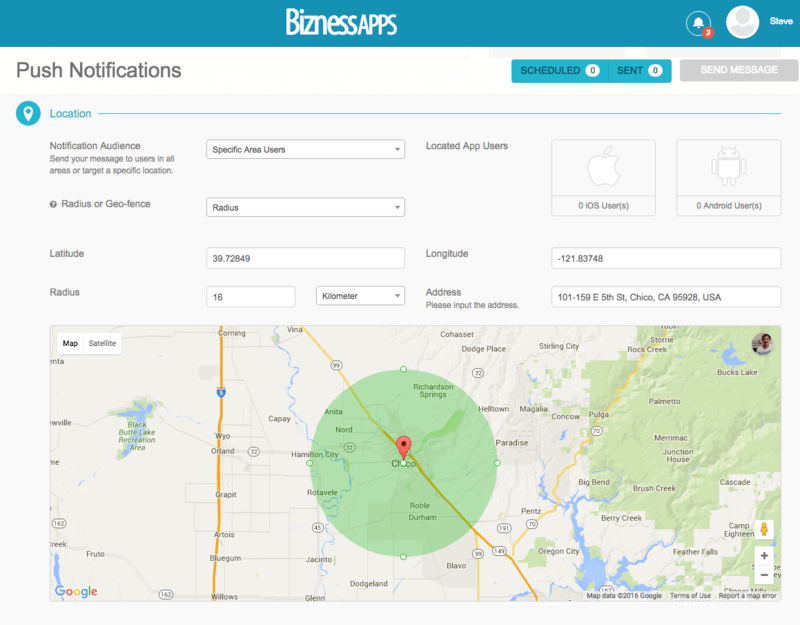 Support is big positive with Bizness Apps. They have many step-by-step sections within their online knowledge base, and the search works well. This area also has a host of FAQ. On top of that they have an active blog, and also a video channel. Live chat and email is available, and response times were extremely fast. 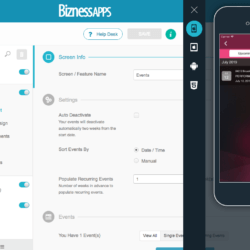 While most things seem logical within Bizness Apps builder, it’s still a little slow and is harder to use when compared to our top rated app maker. This, of course, detracts from the fun. 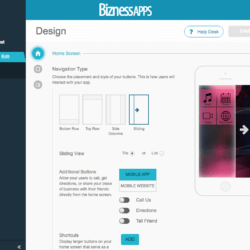 Bizness Apps is a competent app maker with great support and a wealth of information for app makers. On the downside it’s a little lacking in the UX and overall design department. 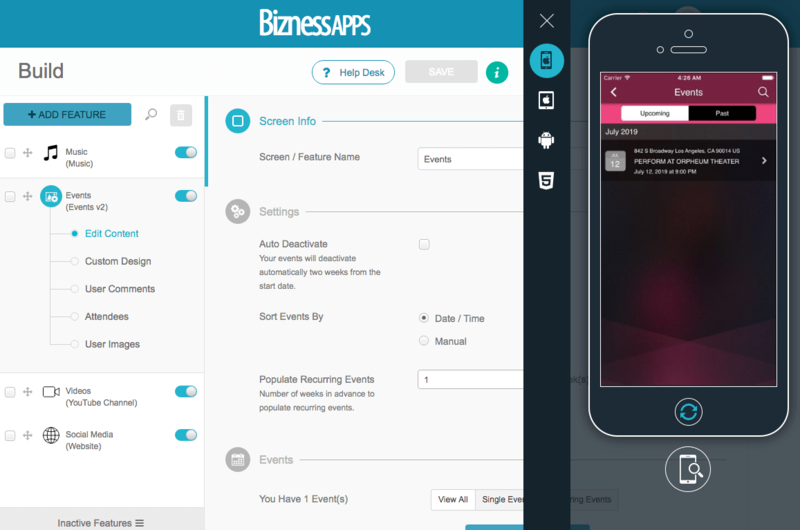 Bizness Apps impressed us with some of their features, and its backend is easy to get your head around. They offer some nice marketing tools for users, such as generating screenshots when publishing your app to the stores, as well as a wealth of information via their blog and webinars. 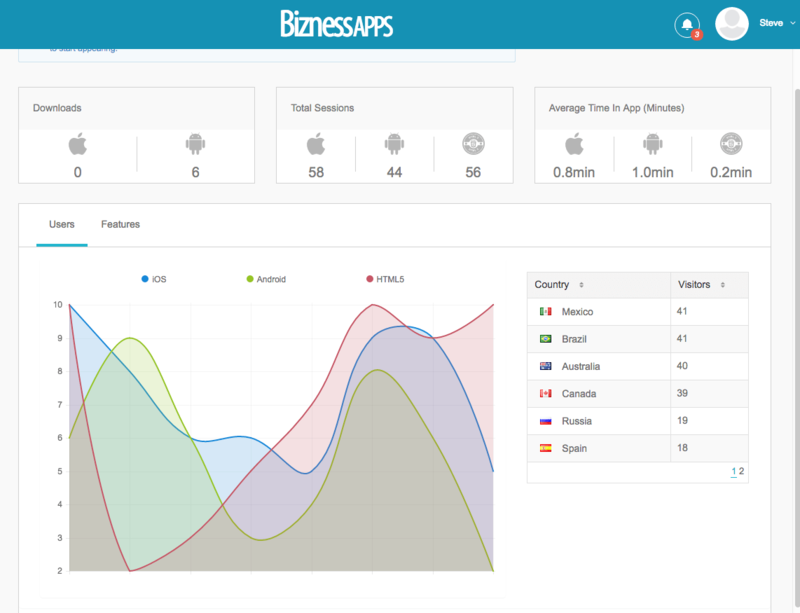 As mentioned, Bizness Apps are a little more expensive than other app makers, though this does include submission to the Apple App Store. So if this is something you don’t want to deal with yourself, then it might be worth the extra cash. While it offers some genuinely handy features, there are still a few more we’d love to see, such as different logins for team members, a simple way to keep your content when switching templates, an easy-to-add live stream feature, and a better app previewer. It’s great that they offer ad support, and their animated slide images could be used to great effect by design-savvy app makers out there. 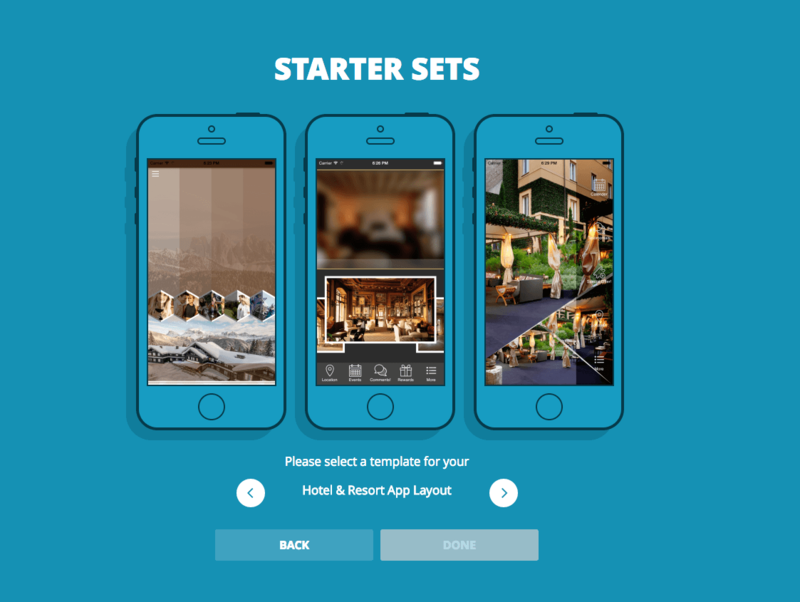 Design is a key word here, as it will take a bit of design knowledge and skill to make your app look really professional. 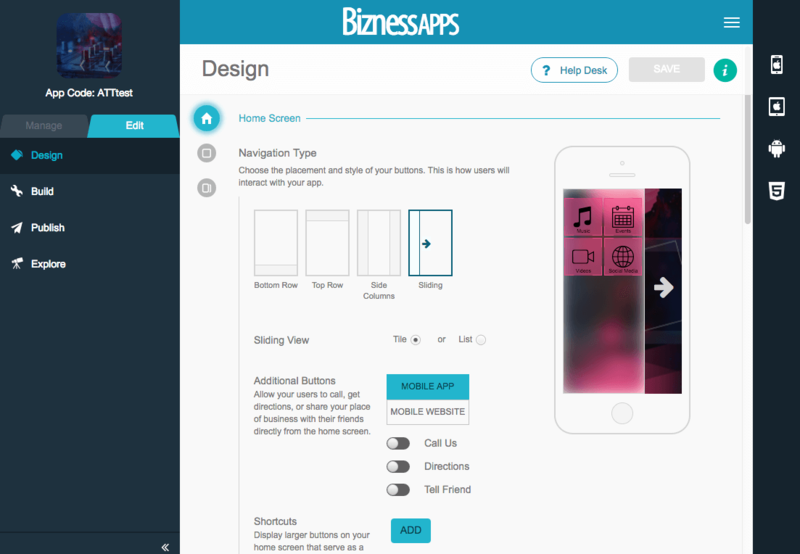 But if you have that, and perhaps you want to create an app for your small business, then Bizness Apps could work well for you! 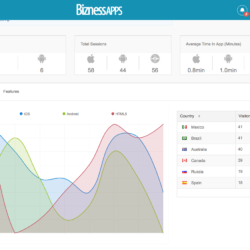 Compare Bizness Apps to other app makers here! Is the price for one app? Yes, the prices are per app. But you can publish this app to multiple platforms such as iOS, Android or the web. If you want to create multiple apps (for yourself or to sell them), have a look at the Reseller option.